Before we left on vacation I pieced the top of this quilt for Harper. I was able to find a little bit of time this weekend to finish the blanket for her. I originally made this quilt for her, which I still love. Too bad my husnabd won't let me put it on our bed. After living with the queen size bed in her room for many months, we realized it was just too big for her room. So we put her back into a twin size bed. 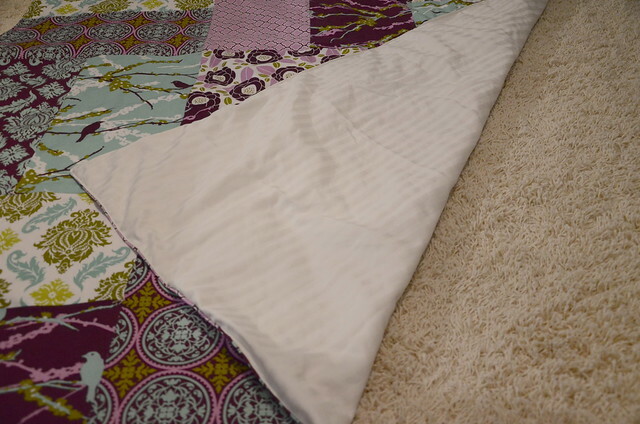 I have been making due with the queen size quilt on her twin size bed, but it has been driving me crazy. This quilt isn't as big as a twin size quilt. 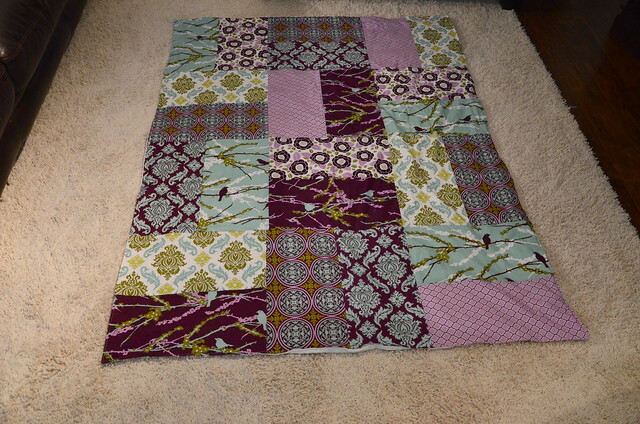 I forgot to measure it to be able to give the final dimensions, but it is more of a throw size quilt. 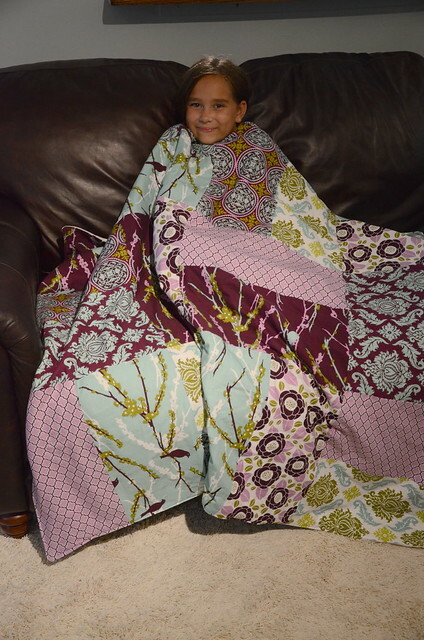 We hope to eventually build her a loft bed for her room, so I didn't want to make the quilt too big. I came up with the design myself. I ordered half yard cuts of the fabric, so I wanted to be able to utilize as much of the fabric as possible. I used Joel Dewberry's Aviary 2. I am happy with how it turned out. I used a thrifted flannel sheet for the batting and an old sheet as the backing. Harper wanted it to be somewhat lightweight. I tied it in all of the corners where the different fabrics meet. She loves it. You can tell it is just the right size for her. I love it! One of my friends from church said that she'd show me how to use my machine. I might actually learn HOW to sew this year!!! Yay! What a great quilt! Thanks so much for sharing on Tout It Tuesday. Hope to see you tomorrow. Very pretty! I love how it turned out!